It was chilly this past weekend (yay!) and I actually had to layer some shirts and bundle up a little (double yay!). I even thought I’d try to wear a scarf. Not the utilitarian kind, though – something zany, and dare I say, ‘fashionable’? Maggie over at Mighty Girl posts about stuff she wears on trips, which interests me, and she’s talked about circle scarves. See? 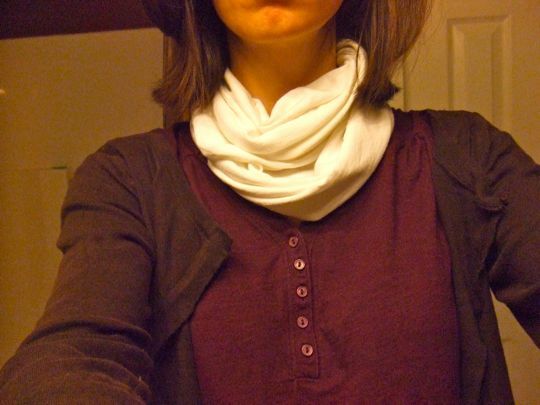 Right there – ‘circle scarves’ is not something that enters my fashion-less vocabulary. However, the article intrigued me. The scarves you buy from stores are super-long and cost many dollars. I’m far too cheap to ever buy one, and far to insecure to wear one in public. I needed the experience of wearing one with minimal investment. 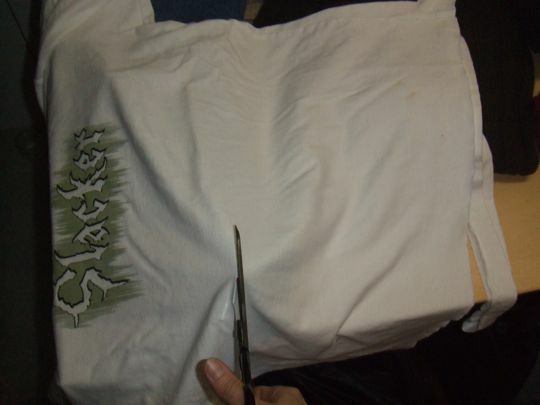 Old t-shirts with stains? Check. Wearable in the house? Check. Bring on the cold! Also, after this was all over and I was patting myself on the back for being so resourceful and inventive, I googled it. Turns out I am very late to the cutting-up-t-shirts game. I made three – this white one (very warm), a gray one (not warm at all – it’s from a t-shirt from college that was threadbare and ancient), and a green one (men’s t-shirt – that’s the winner). Good luck, vampires. Try and get me and I’ll barf on you. I have an idea about that back of the neck thing: maybe you’re a Sontaran and you don’t know it. Dang it. You said FRONT of the neck. You’re not a Sontaran then. You didn’t really look like one anyway. I don’t know -- I think my great-great grandpa was a Sontaran…. I just wasted three minutes of my life googling “Sontaran”. I had to look it up too…but I laughed so it wasn’t wasted time! Sontarans’ heads resemble talking baked potatoes. HA! Oh Lauren…you are wrong…you are quite fashionable! This scarf is great! And they would make great Christmas gifts! Really. I wouldn’t need one for inside, but when it gets down to single digits, I would need one to match either a red coat or a white one.